High-res display. Long-life battery. Even the keyboard is impressive. The Asus Chromebook Flip C302CA is ahead of its time. All Chromebooks shipping in 2017, including the Chromebook Flip, can run Android apps natively. We’ve tried Android apps on Chrome and can see lots of potential for broadening a Chromebook’s capabilities. We really wanted to review this feature on the Chromebook Flip, but as of this writing, the technology remains in beta. Meanwhile, we can still appreciate the Chromebook Flip for its higher-end components and performance. They’ll cost you—$499 for our model (a lower-end version costs $449). For the money, however, the Chromebook Flip offers a far better user experience than the more popular $200 Chromebooks can, one you might still like in a few years. 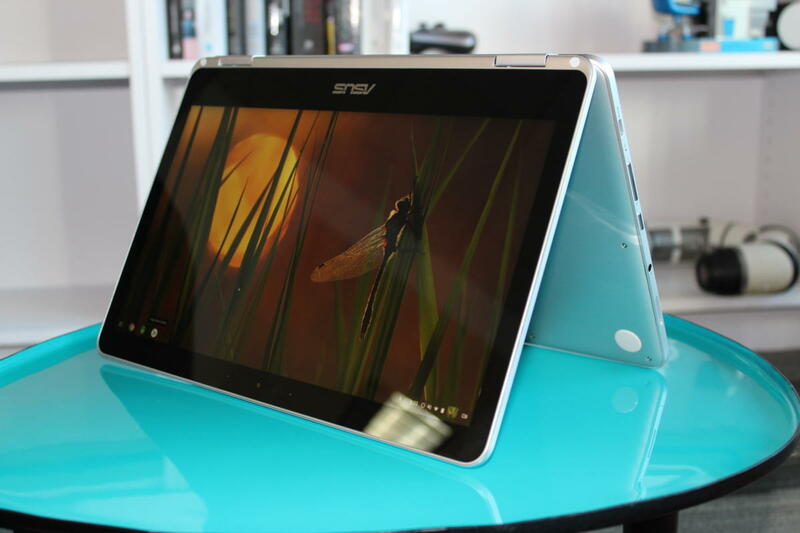 The Chromebook Flip’s 360-degree hinge means you can use it as a tablet. 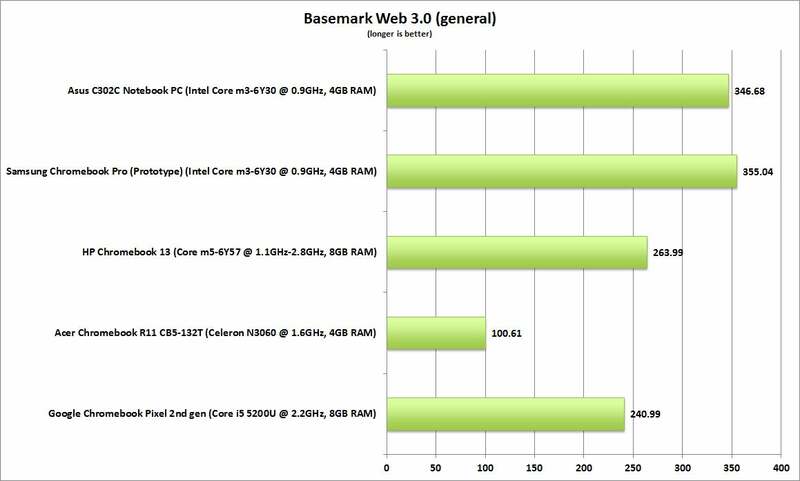 CPU: Intel Core M3-6Y30 0.9GHz. This is a 6th-generation (Skylake) mobile processor with two cores and four threads, 4MB of cache, and a maximum burst clock speed of 2.2GHz. This won’t burn any barns, but it will get through mainstream tasks capably, as the performance tests below prove. 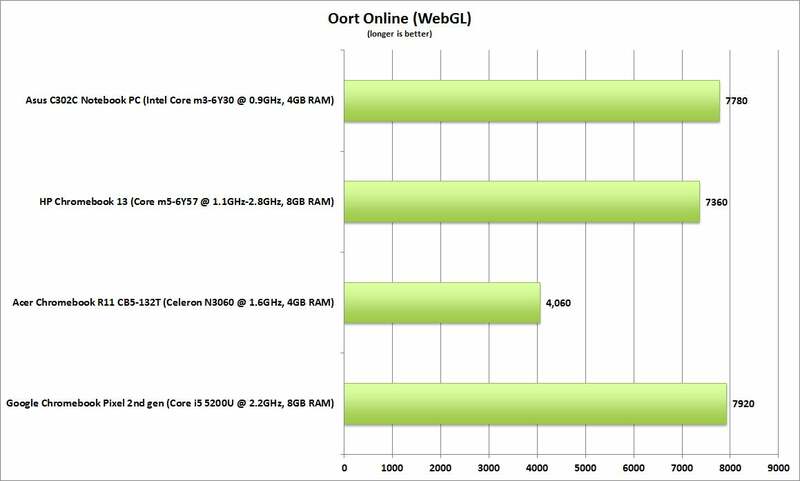 A lower-end option is a Pentium 4405Y, and a higher-end option is Core M7-6Y75. 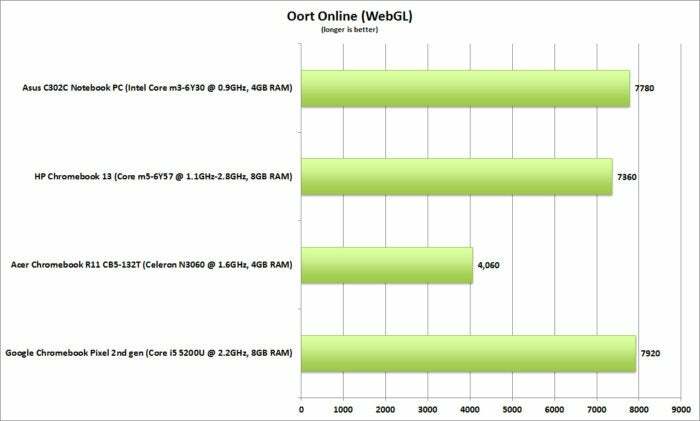 RAM: 4GB LPDDR3. This is an adequate amount of memory for mainstream tasks, but if you pile on the browser tabs or stream extensively, you could hit a wall. A higher-end Chromebook Flip model offers 8GB of RAM, but obviously costs more. Graphics: Intel HD Graphics 515. This is a mainstream integrated graphics solution, not as powerful as Intel’s Iris integrated graphics, but it’ll get you through streaming video. Storage: 64GB eMMC with TPM. The eMMC flash storage is inexpensive, but not very fast. The 64GB amount is better than the 16GB or 32GB you might find on cheaper models. The Trusted Platform Module is a security feature that can encrypt sensitive information like login credentials. Two USB-C ports: Specifically, they are USB 3.1 (Gen 1), with a data transfer rate of 5Gbps. 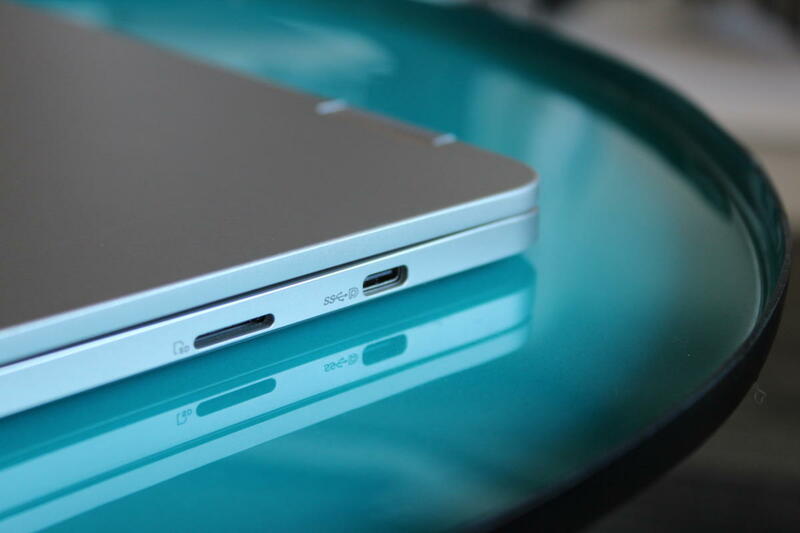 Both ports—one on each side of the laptop—may be used for data or charging. I appreciate the versatility of their opposite locations. There are no USB-A ports, so prepare to commit to this new connectivity standard (and prepare to buy a USB-A dongle for legacy devices). The USB-C ports, one on each side of the Chromebook Flip, can be used for charging or data transfer (at up to 5Gbps). 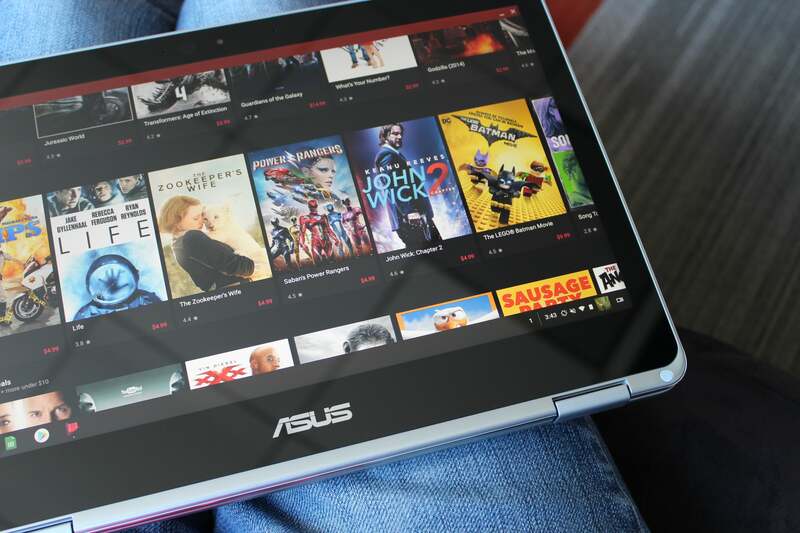 A 360-degree hinge means you can set up the Asus Chromebook Flip in tent mode for viewing movies or presentations. Three other notable features deserve highlighting. The Chromebook Flip’s matte-finish aluminum body is sturdy and lends a bit of luxury (as well as cost). The 360-degree hinge gives the Chromebook Flip its clamshell-to-tablet versatility, which should prove especially handy when Android app support comes online. Finally, I want to call out the full-size, chiclet-style keyboard for being remarkably comfortable to type on. 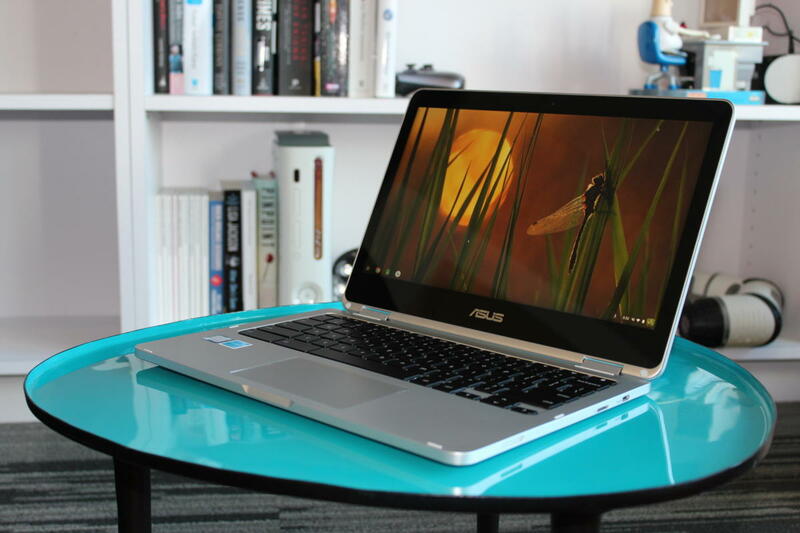 Asus uses a scissor-cut mechanism and offers 1.4mm of travel. The keys themselves are plastic and flat, but they have a slightly soft finish. All I can say is that it doesn’t feel like I’m typing on rocks, which is what I’ve experienced on far too many lower-end Chromebooks’ keyboards. The trackpad also works well—it’s spacious, smooth, and responsive. 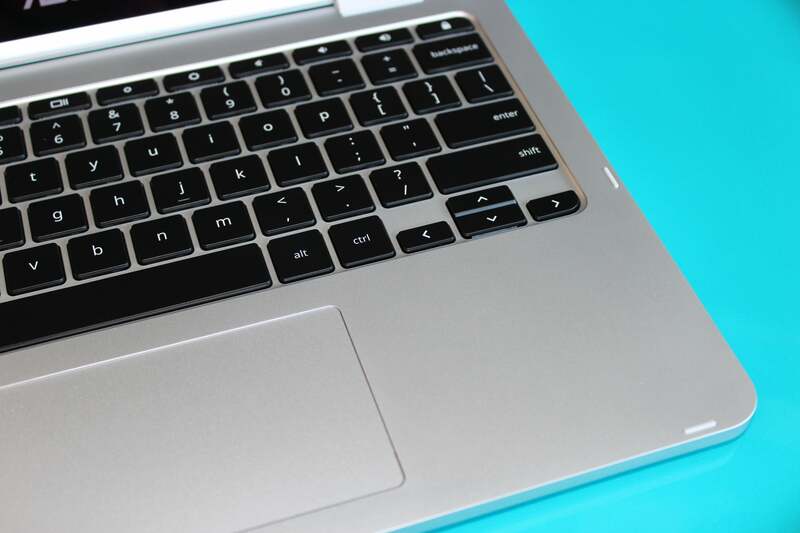 The keyboard on the Asus Chromebook Flip C302A has a comfortable 1.4mm travel. When we talk about Chromebook performance, remember that Google updates Chromes OS every six weeks. We return our test units and are therefore unable to update and retest them, so newer models will always benefit from any recent improvements Google made to Chrome. The Chromebook Flip’s middle-of-the-road power plant performs well in most respects, at least on the mainstream benchmarks we run. It’s the topmost bar (though not always the top dog) in all of the following charts. The Cr-XPRT test measures Chromebook performance in basic productivity tasks as well as more demanding activities, such as watching movies or playing games. The Chromebook Flip can’t compete with the high-end Google Chromebook Pixel and HP Chromebook 13, but it’s right in the upper-middle with the similarly equipped Samsung Chromebook Pro, which we tested in prototype. 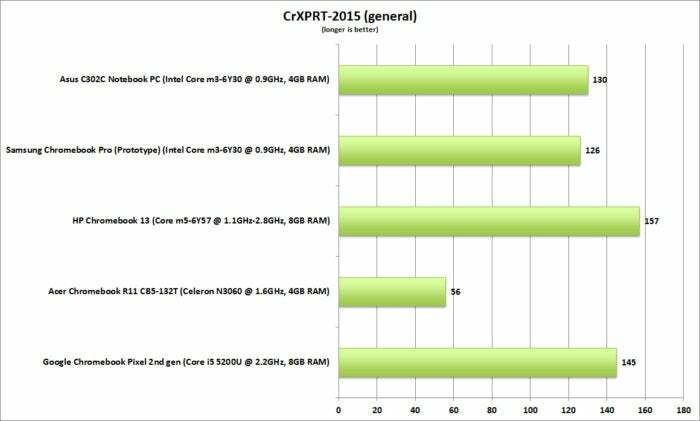 We also ran Cr-XPRT’s predicted battery runtime test. For the test, we set the Chromebook Flip’s brightness as close to 200 nits as possible, and attach headphones for audio output. The Chromebook Flip, with its 2-cell, 39Whr lithium ion battery, posts a runtime of 10 hours flat—exactly what Asus promised. I have to say it was liberating to know I could tote this Chromebook around for even a couple of days of light, occasional use without having to search for an AC outlet. >The Asus Chromebook Flip C302A is not the best-selling Asus Chromebook on Amazon. That distinction currently goes to its cousin, the Asus Chromebook C202A, which is actually the only low-cost Chromebook I’d recommend. When you’re ready to step up to advanced features, however, such as a nicer display, 360-degree hinge, and a real metal chassis, you can stay within the Asus family and graduate to the Chromebook Flip C302A. It’s a Chromebook that you can keep using for years (perhaps even the full five years that Google promises to support it) without feeling constrained by the hardware. And when Android support becomes official, I know you’ll like that tablet mode.